Motorbike and scooter battery sizes, specifications and weights. Ideal if your looking to compare different batteries or if your looking for a battery to fit your bike but only know the required size or power output (this can be especially useful for Chinese or no name motorcycles and mopeds). 6 Volt Lead acid batteries (also known as conventional batteries) usually come with the acid in a separate pack and are filled through the stoppers in the top of the battery (3 stoppers in the top of a 6v battery, usually yellow in colour). These type of battery have upper and lower level marks on the front and need to be checked and have the electrolyte level topped up with DISTLLED WATER occasionally. Lead acid batteries (also known as conventional batteries) usually come with the acid in a separate pack and are filled through the stoppers in the top of the battery (6 stoppers in the top of a 12 volt battery, usually yellow in colour). Maintenance free batteries (also known as sealed batteries) usually come with the acid in a separate pack. Once the acid has been poured into the battery and the plastic top has been firmly pressed into place, the battery is completely sealed and shouldn’t require any more topping up or have the acid levels checked. 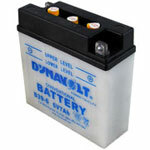 Gel filled batteries are commonly used in motorbike’s where the battery lays at an angle or flat.